Let’s face it – summer is winding down. I should be looking forward to fall squash, crisp tart apples, and colourful leaves falling from trees, but I’m NOT READY YET. It still feels like summer here, even though the skies are now dark before 9pm. It’s still warm out at 10pm, and later today I’m biking over to the PNE, which is a big ol’ summer fair with the best wooden rollercoaster, corndogs on sticks and a barn full of cute animals. I’m cramming in the best of summer as quick as I can. Lately, salads have played a key role in how I eat when it’s hot out, but I need to throw out a fist bump for sandwiches. 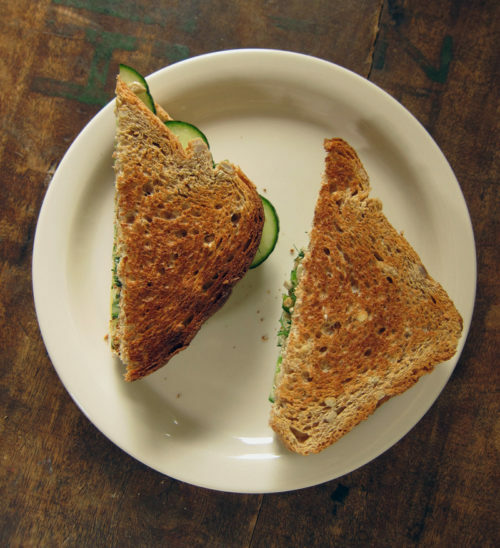 Especially a sandwich that is a study in contrast in the most delicious way. See all the layers? 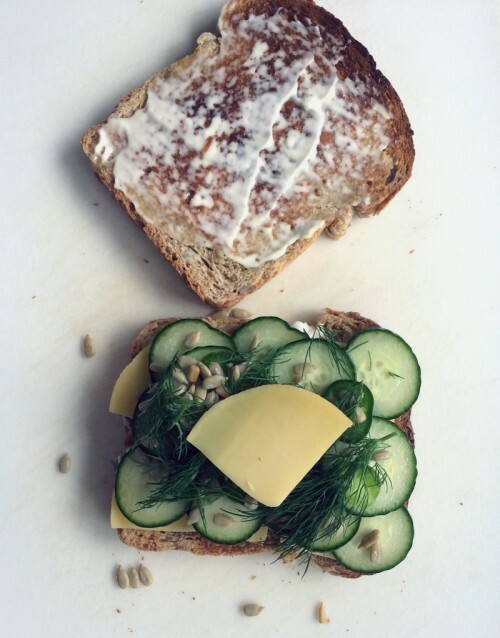 There’s crunchy wholewheat toast, firm slices of Gouda, crisp & refreshing cucumbers, mild shallots, a spicy slice of jalepeno, leafy & heady dill, salty sunflower seeds and a light schmear of mayonnaise. Everything comes together into one heck of a sandwich. I work from home so it’s easy to prepare for a satisfying lunch. And since I first made this in early July, it’s been on lunchtime rotation almost weekly. You can sub into almost any cheese. I’ve tried Havarti and a good, strong Cheddar with equally fine results. If you don’t love mayo, a good spread of cream cheese would kill two birds with one tasty stone. I love fresh dill, but I’m sure some basil would add an interesting twist. 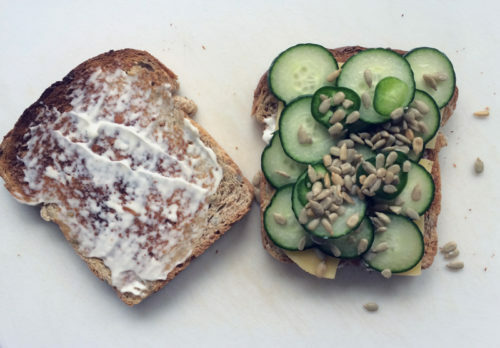 The idea to add in sunflower seeds came from a sandwich I had years ago. It was purchased from a deli close to the ferry terminal en route to a quick day hike to Bowen island. The sandwich was a vegetarian one filled with cucumbers, cream cheese and smoked almonds. I’m sure there were other things in the sandwich as well, but it was the smoked almonds that hit me like a lightening bolt. Here was a great texture with a delicious non-meaty way to add that delicious smoky flavour. But smoked almonds and me are a dangerous combination–I’ll pretty much start on one smoked almond and won’t stop until the bag is over. So sunflower seeds seemed like a good enough substitute. If you have the gift of self-control, go ahead and add in some chopped smoked almonds (and maybe some cream cheese too!). Sandwich days. Enjoy this sandwich right now while there is still time for tank tops and sandals and your neighbour hands you a fresh-from-the-garden cucumber. Luckily sandwich days last year-round. Enjoy! Toast your bread. Slather both slices with mayo – as thin or as gloopy as you like. Layer slices of cheese over 1 slice of toast. 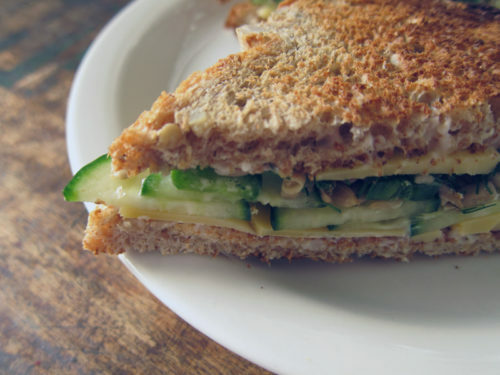 Layer slices of cucumber over top. Sprinkle with sunflower seeds. 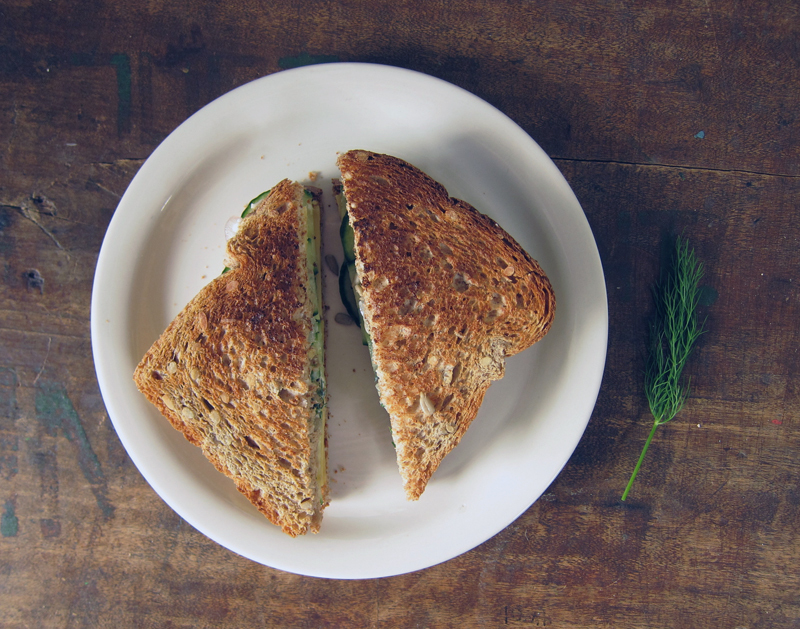 Strategically place shallot and jalepeno slices here and there. Tear up some dill over top and add a pinch of kosher salt if you’re like me. Grind some fresh pepper over the whole thing. 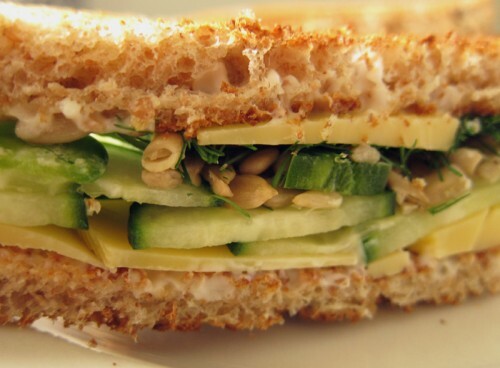 If you’re feeling extravagant, go ahead and add another slice of cheese….go on! Top with 2nd slice of toast, mayo side down (do I really need to mention that? ), and slice on the diagonal. Eat. 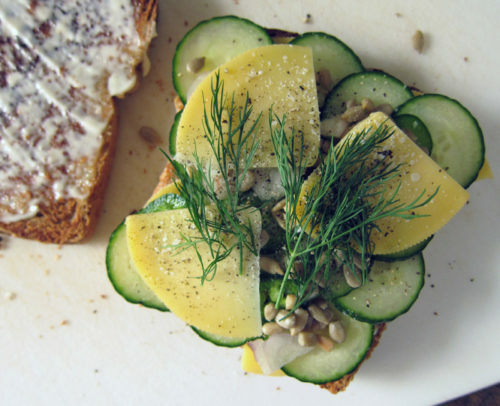 Such a great lunch summer sandwich! Way to keep the summer spirit alive. 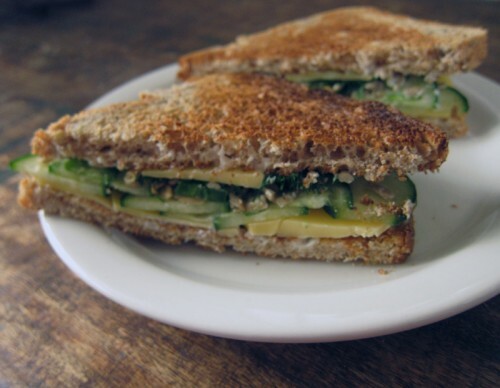 I absolutely love cucumber sandwiches and definitely do not make them nearly enough! I’m not ready for fall either. Nor winter. I’m just a summer person. I’m happier when it’s warm and sunny. That being said, the addition of nuts in this sandwich can also make me quite happy! Nuts takes it to a whole new level for me. Why haven’t I ever thought of this before. Although I do enjoy all kinds of nuts, the sheer mention of smoked almonds is enough to get me giddy with excitement. I am not to be trusted with a bag of them either. Yum, yum yum! I’ll have to give this a go – I wouldn’t have thought of adding sunflower seeds. We seem to be on a similar wavelength this week! What a great sandwich, I can see why you started eating this in July and it’s still a favorite! This sandwich sounds so simple and delicious! I love the idea of punching up classic cucumber & cheese with spicy jalapeno. Thanks Joanne, it’s a tasty lunch! Sues, it’s a good reminder. Nuts are all good, Joanne 🙂 A nice, unexpected bite to a sandwich. Dawna, yes indeed! I’ll have to try your version too – looks very dainty & delightful!! Yes, Eileen, jalapeno gives it a nice bit of heat. I’ll bet the dill adds just the right touch. Brilliant! This is something new. I’m serving sandwiches daily to both my kid and husband and is looking for new recipe. This one is both easy and fresh. Something my husband would love to try. And me too!! Camille, I hope you like this 🙂 It’s simple but a little different from the norm. What a great idea about using sunflower seeds. It really does add a special something to sandwiches.